If I barely make any sense in this post, then don't worry - I'm tired, which will explain why I probably sound bleh here XD Anyway, I am back with Day 02 of this 30 Day Hello! Project Idol challenge, and whilst yesterday was my favourite member(s), today is the opposite of favourite. Yup, you guessed it! Day 2 focuses on the idol who I don't really like, so, onto the disliked Idol! Hate is really a strong word. I prefer the terms Loath and extreme dislike to the point where I want to hit her. Okay... maybe not the second one, but you get the point, right? And in all honesty, this isn't going to be a tough decision, because I have disliked her since the day I got into Hello! Project, and whilst many of you will disagree, I really just don't like her. 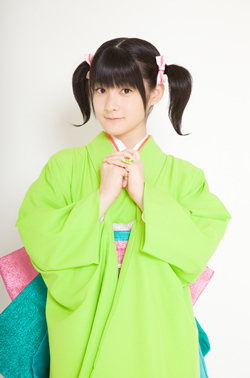 ... Urgh, Momoko Tsugunaga. Momoko has never been a favourite of mine, even when I watched Shugo Chara and found out about Buono (right after Kusumi Koharu, no less). I find that her constantly trying to be cute is an annoyance in some ways, and also kind of unfitting for her. Now, I could go down the road of SHE'S MY AGE, FOR CRIPES SAKE! but I won't, because I act childish - then again, I don't put it on for the camera. Actually, I could totally use the cute argument against Sayumi as well, but I am biased, plus Sayumi is really really cute - sometimes Momoko is cute, and other times she isn't. Then again, this is just my opinion. I guess another thing that I truly do dislike about Momoko is her voice - when she uses her real voice, I really like it, but when she puts on that god-awful squeak I just want to throw her out of a window and cackle as she falls down 10 feet or so. Anyway, that will conclude today's post. Tomorrow, what question shall be asked, and who shall be featured? Only time will tell - let's just hope that I will remember.